(HealthDay)—In patients with atopic dermatitis (AD) and birch pollen allergy, consumption of birch pollen-related foods is associated with allergic reactions and deterioration of AD, according to a study published online April 13 in Allergy. Anja Wassmann-Otto, Ph.D., from Hannover Medical School in Germany, and colleagues conducted double-blind placebo-controlled food challenges (DBPCFC) in 182 children and adults with AD and suspected birch pollen-related food allergy. The researchers found that 65 patients developed allergic reactions (responders) to DBPCFC with birch pollen-related foods (103 DBPCFC). Of those with allergic reactions, 32 patients exhibited significant deterioration of AD. Compared to nonresponders, responders showed significantly higher specific immunoglobulin E (IgE) levels to birch pollen and apple in addition to a higher prevalence of allergic rhinoconjunctivitis. Patients with late eczematous response could not be differentiated by specific IgE levels from those with isolated immediate type reactions. 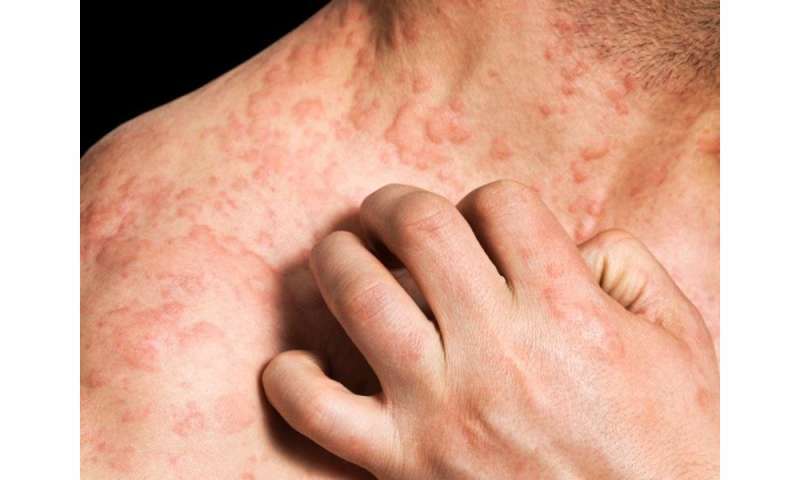 "In a subpopulation of patients with AD and birch pollen sensitization, related foods should be considered as a trigger for an aggravation of eczema," the authors write. "Since sufficient markers for prediction of late eczematous reactions are still lacking, DBPCFC cannot be replaced in diagnosis of birch pollen-related foods in patients with AD."